In this article, we take a look at how the open source Wallaroo big data platform can be used to quickly spin up a data cluster. Last month, we took a long-running pandas classifier and made it run faster by leveraging Wallaroo’s parallelization capabilities. This time around, we’d like to kick it up a notch and see if we can keep scaling out to meet higher demand. We’d also like to be as economical as possible: provision infrastructure as needed and de-provision it when we’re done processing. If you don’t feel like reading the post linked above, here’s a short summary of the situation: there’s a batch job that you’re running every hour, on the hour. This job receives a CSV file and classifies each row of the file, using a Pandas-based algorithm. The run-time of the job is starting to near the one-hour mark, and there’s concern that the pipeline will break down once the input data grows past a particular point. In the blog post, we show how to split up the input data into smaller dataframes, and distribute them among workers in an ad-hoc Wallaroo cluster, running on one physical machine. Parallelizing the work in this manner buys us a lot of time, and the batch job can continue processing increasing amounts of data. Sure, we can handle a million rows in a reasonable time, but what if the data set grows by orders of magnitude? 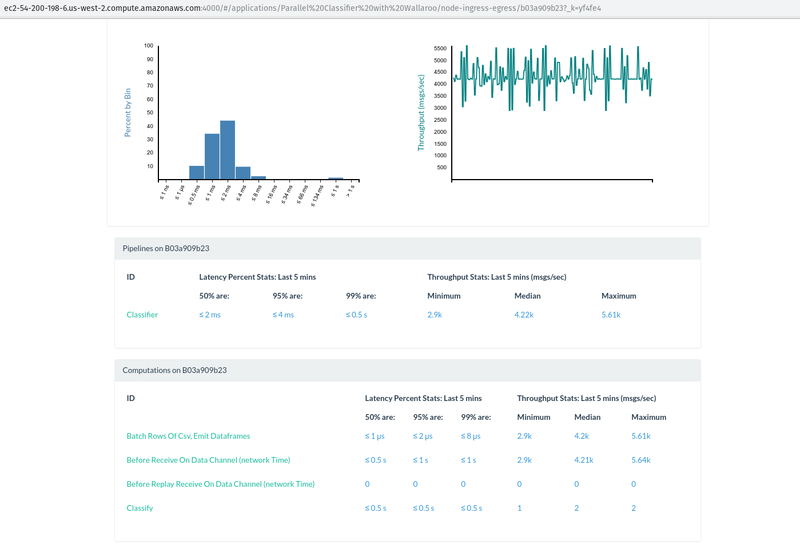 By running our classifier on a local Wallaroo cluster, we were able to cut the processing time of a million rows to ~16 minutes, thus fitting within our allotted time slot of one hour. But if the input data is, say, 10x more, we’re going to have a hard time processing it all locally. 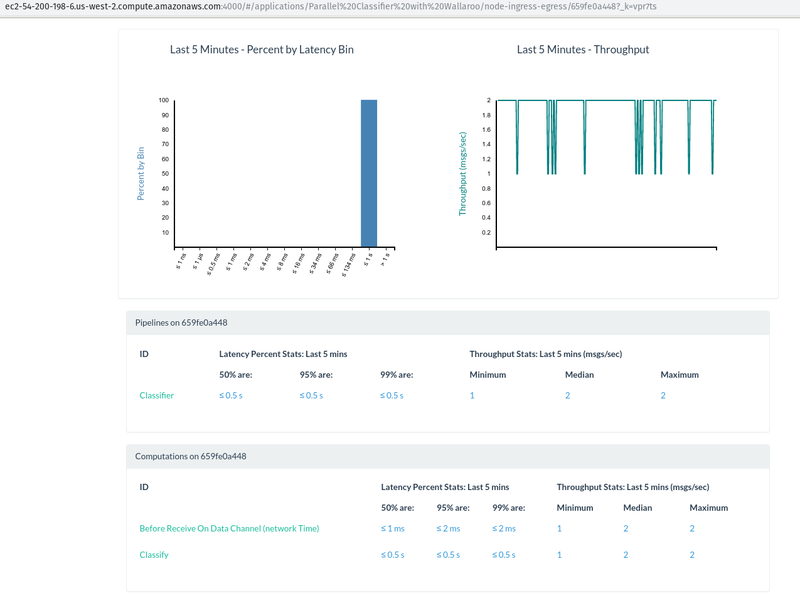 Let’s see how we can keep up with the data growth by launching a cloud-based Wallaroo cluster on-demand, running the job, collecting the data, and shutting down the cluster, all in a fully automated fashion. Wallaroo’s big idea is that your application doesn’t have to know whether it’s running on one process, several local processes, or a distributed system comprising many physical machines. In this sense, there’s no extra work involved in ‘migrating’ our classifier application from the previous blog post. We will need some tools to help us set up and manage our cluster in the cloud. Wallaroo can work with a lot of different tools. Our friends at Pulumi provide an excellent tool that removes the headaches involved in provisioning infrastructure. 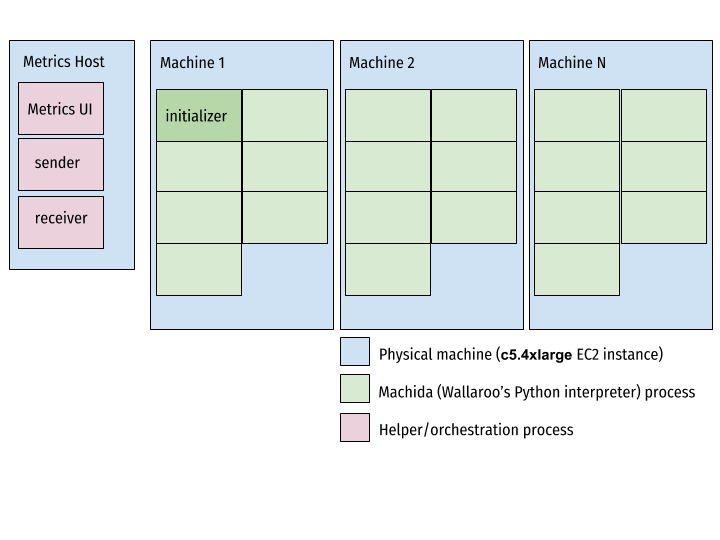 We’ll use Pulumi to define, set up, and finally tear down our processing cluster in this example. We’ll also need Ansible to start, stop, and inspect the state of our cluster, and, last but not least, we’ll need an AWS account where our machines will live. First of all, if you’d like to follow along (and spend some money provisioning EC2 servers), please download and set up Pulumi. Next, clone the Wallaroo blog examples repo and navigate to provisioned-classifier. If you followed along with the previous Pandas blog post, you’ll find our old application nested away here, underclassifier. What’s more interesting are the two new directories: pulumi and ansible. Let’s break that down and see what’s really going on here. 1) make up CLUSTER_SIZE=3 configures the cluster to consist of 3 machines and delegates to pulumi up the actual business of spinning up the infrastructure. Our physical cluster will contain 3 nodes for processing, and one extra metrics_host node for hosting our Metrics UI, and collecting results. 2) Once provisioning is complete, the next make task, run-cluster INPUT_LINES=1000000, uses our Ansible playbooks to upload application code from classifier/* to all three machines provisioned above, and then start up a Wallaroo cluster with 7 worker processes per machine. Next, Ansible starts sending 1 million lines of our synthetic CSV data and waits for 1 million lines to arrive at the data_receiver process. When those lines arrive, they are compressed, and the cluster is shut down. 4) And, finally, make down destroys the cloud infrastructure that was used to power our computation. As you can see from the above, our little instance() function encapsulates the common settings for every machine that we want to provision. The metrics_host and initializer are ec2.Instance objects with descriptive names, while the workers are ec2.Instances that are distinguished solely by their ordinal number. Pulumi lets us define – in code – things like Security Groups, SSH keypairs, and practically every other aspect of cloud infrastructure. We can use Pulumi’s output to stitch together an Ansible inventory, which will let us interact programmatically with our provisioned instances. If we want to modify our cluster, we can edit pulumi/index.js, and then rerun make up CLUSTER_SIZE=N. If the changes don’t require restarting the instances (for example if they only concern the Security Group), Pulumi will do the right thing and not disturb the rest of the infrastructure. If you examine the Pulumi definition file in depth, you’ll see that it relies on a mystery AMI: ami-058d2ca16567a23f7. This is an experimental Ubuntu-based image, with Wallaroo binaries (machida, cluster_shutdown,cluster_shrinker, and data_receiver) pre-loaded. For now, it only exists in the us-west-2 AWS region, but we hope to make Wallaroo AMIs available for experimentation in all regions starting with the next Wallaroo release. The data source – In our case it’s the file send.py, which can generate and transmit randomly-generated CSV data for our computation to consume. The machida processes: one Initializer and a bunch of Workers. The distinction between the two is only relevant at cluster startup. The data receiver – A process that listens on a TCP port for the output of our computation. This is the data_receiver, provided as part of a Wallaroo installation. The metrics UI – Our Elixir-powered real-time dashboard. Our Ansible playbook takes care of coordinating the launch of the various components and making sure that their input, output and control ports match up. In particular, that the cluster initializer starts up knowing the total number of workers in the cluster, and every other worker connects to the initializer’s internal IP and control port. See here if you’re interested in a detailed discussion of clustering. Once the cluster is up and running, and the initializer node’s TCP source is listening for connections, we start up the sender and instruct it to send a stream of data to the TCP Source. In a realistic batch scenario, this sender could be implemented as a Connector that reads a particular file from a remote filesystem or S3. For our purposes, we’ll simulate this by generating a set number of CSV lines on-demand, and then shutting down. While the work is being performed, we can take a look at the metrics URL printed out on the screen to find out how the work is being distributed. 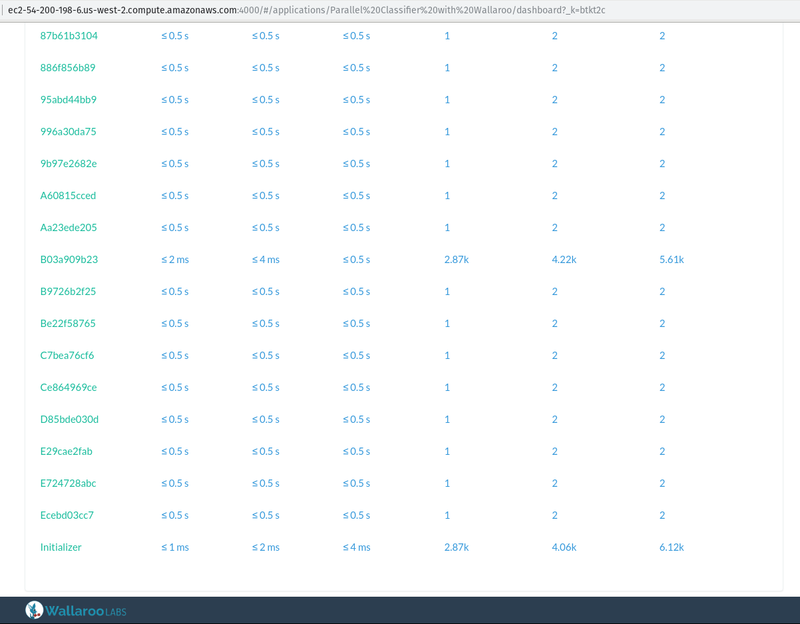 In the screenshot above, you can see that the Initializer and B03a909b23nodes are processing about 4k messages per second each, and all the other workers have the classification work split evenly among them. Don’t be surprised that two of the workers are processing orders of magnitude more messages! Remember our Pandas application pipeline? Looking good. All that’s left for us to do is wait until the job completes and we receive our zipped data onto our disk. Now, let’s see how much speedup we can achieve from scaling out with our provisioned-on-demand infrastructure. Even though there is some constant overhead involved in spinning up the required infrastructure (clearly too much overhead to justify spinning up clusters for less than 1 million rows), we’re now able to classify a hefty 10 million rows of CSV data in under half an hour, and 30 million in a little over an hour. This gives us some perspective on when our application will need extra resources, or perhaps some performance optimizations. As long as the data fits in the 1 million:10 million range, it seems that a cluster of 4 machines represents a sweet-spot between price and performance — we can process the data and still fit in the hour-long window allotted for our batch process, but not have to incur unnecessary infrastructure costs if we don’t need the extra speed. The above figures illustrate how Wallaroo can be used as an ad-hoc compute cloud, using Pulumi and Ansible to provision, run workloads remotely, and shut down the infrastructure once the results are in. In the case or our batch job, we can leverage this pattern to scale horizontally on-demand, even when the incoming workloads exceed the capacity of one physical machine — all while running the exact same Wallaroo application that we run locally as part of our regular development. Wallaroo handles the scale-aware layer of our program, so we can focus on the business logic and flow of our data. Published at DZone with permission of Simon Zelazny , DZone MVB. See the original article here.